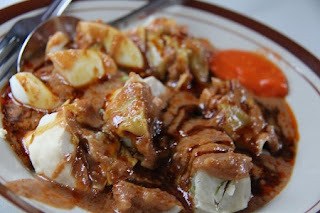 Siomai atau siomay adalah salah satu jenis dim sum. Dalam bahasa Mandarin, makanan ini disebut shaomai, sementara dalam bahasa Kanton disebut siu maai. Dalam dialek Beijing, makanan ini juga ditulis sebagai 燒麥, dan juga dibaca shaomai. First we make the dough siomaynya first. Steam the squash until cooked, then puree. Continued with smoothing spices such as garlic, onion, and pepper. After that mix snapper, chopped chicken, chopped green onion, fish sauce, eggs, sugar, salt, chicken powder, sago farm, squash and spice paste before. Then stir until well blended. Next prepare the steamer steamed and do not forget to give the board a banana leaf, then form dumplings. You can use two spoons to make siomaynya. Put it in a steam boiler and steam for approximately 20 minutes. You can also include dough into ready-made dumplings skin. Leave the dough also for the stuffing out later. For supplementary material, soak in hot water and cabbage rolls as resembling bolsters. Boil chicken until cooked eggs. Marinate tofu into Galam water for approximately 30 minutes. Afterwards, rake the middle, fill with remaining dough dumplings earlier, and steam for about 15 minutes. Next is to make the peanut sauce. Saute chili and garlic until fragrant uses less oil. Then mix with salt, lime leaves, fried peanuts, sugar and puree with pulverized way. Boil some water, put peanut sauce smoothed before, give water to tamarind taste, and taste great. If the taste of peanut sauce is just right, set aside. Dumplings with peanut sauce, accompanied by a delicious ready to eat with loved ones. Accompanied peanut sauce, do not blame your tongue if you are going to be hooked enjoy dumplings this one. May you succeed in making this delicious dumplings.